At the heart of Duncan's tales are characters undergoing the complex and violent process of transformation, with results both painful and wondrous. Equally affecting are his nonfiction reminiscences, the "river teeth" of the title. He likens his memories to the remains of old-growth trees that fall into Northwestern rivers and are sculpted by time and water. These experiences—shaped by his own river of time—are related with the art and grace of a master storyteller. In River Teeth, a uniquely gifted American writer blends two forms, taking us into the rivers of truth and make-believe, and all that lies in between. His novels The River Why and The Brothers K have been compared to everything from Catcher In The Rye to Zen And The Art Of Motorcycle Maintenance and To Kill A Mockingbird, but David James Duncan's distinctly wies, rueful, funny, and luminous voice belies comparison. 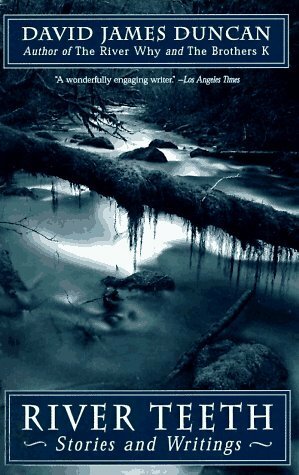 In River Teeth, Duncan brings us stories of indelible characters: a solitary woman struggling to corral of flock of idiot sheep; a young girl who creates a strange fairytale that shatters her parents' love; a modern-day prophet waging war against all who would blaspheme his sacred river. Interwoven with these tales are epiphanies from Duncan's own life, pieces he calls "river teeth", which resonate with the power and longing of memory. The phrase "river teeth" refers to the remains of old-growth trees that fall into Northwestern rivers and are sculpted by the water. In Duncan's rich metaphor, time is the river, trees are our experiences, and "river teeth" are the memories of our experiences shaped by the river of time. The stories and the "river teeth" inform and strengthen each other, allowing Duncan to create a complex and wondrous meditation on love, loss, passion, and of course, flyfishing. "The man, David James Duncan, is touched, touched by the spirit, and he could be a prophet artist, but you can see that he chooses to tell just story -- for this is his mission on this go-around. Read him, digest him. He is a friend." -- Victor Villasenor, author of Rain Of Gold. "David James Duncan is in love with water, the rivers and streams that have coursed through his life. Believe me, you will be swept up by his rivers, carried downstream, and deposited in a new place. In that new place, Duncan will build a fire and tell you a bunch of stories. What else could you want?" -- Sherman Alexie, author of Reservation Blues.